At the height of the summer harvest, farmers markets around Westchester are filled with fresh food and produce from local farmers, bakers, and food artisans. But it’s not simply good food that shoppers enjoy, but a sense of community. 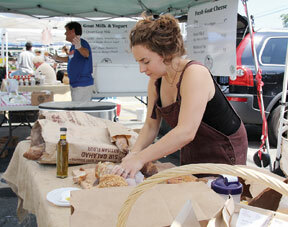 Perusing the food options, you’ll find that markets hold stories the farmers and bakers are happy to share. 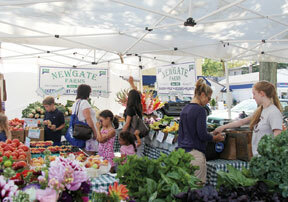 Rye shoppers look for fresh fruits and vegetables from Newgate Farms. At the Larchmont farmers market, Yorktown resident and college professor Nirmala Gupta shares her passion for artisan Indian food with shoppers. Founder of Bombay Emerald Chutney Company, Gupta discusses the difference in taste between the number of vegan fruit and vegetable chutneys to interested shoppers. Many have never tasted spicy tomato or pomegranate chutney before visiting her table at the market. 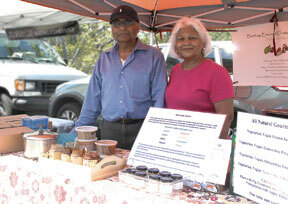 Nirmala and Karan Gupta of Bombay Emerald Chutney Company at the Larchmont Farmers Market. At the Rye farmers market, samples of fresh blueberry and peach walnut crumb pie bring a small crowd around the table of Pie Lady and Son. Now a well-known bakery, Pie Lady and Son started with Deborah Tyler of Nyack baking and selling fresh fruit pies from her kitchen. As orders for the delicious pies grew, her son decided to help manage the business, helping his mother’s business grow. The New York Times has described the bakery as a place “where homemade looks and tastes are not pie in the sky.” At the heart of Pie Lady and Son still lays a commitment to the simple and the personal. Wave Hill Breads, bakery and cafe of Norwalk, Conn., takes bread very seriously. In addition to bringing fresh breads to seven farmers markets each Saturday, Wave Hill Breads supplies more than 80 restaurants and wholesale markets with breads and dessert products each week. Kelsey Nichols of Wave Hill Breads prepares fresh slices of bread for customers. Photos by Marguerite Ward. Westchester resident Lorraine Walsh and her son Douglas come a few times each month to the Larchmont farmers market. For manager of the Larchmont farmers market Michelle Avon, being a part of a farmers market is about supporting the local economy, promoting sustainable, eco-friendly business and simply enjoying good, healthy food. Tags: farmers, farmers market, food, larchmont, local food, locavore, rye, westchester. Bookmark the permalink.